Russian war planes have launched fresh strikes on the Syrian province of Idlib, a monitor says, as talks in Tehran failed to stop an impending military offensive there. 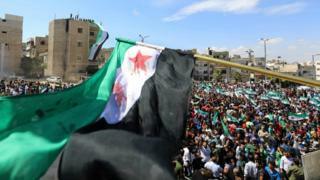 The raids targeted rebel-held positions in Idlib's south-west, the Syrian Observatory for Human Rights said. Syrian forces, backed by Russia and Iran, are poised to attack the last major rebel stronghold in Syria. Turkey and others have warned of a pending humanitarian disaster. In the province itself, thousands of people staged street protests after Friday prayers calling for international protection. In footage circulating on social media, one protester in the town of Al-Dana said they were demanding that the UN "stop the killing of Syrians". What is the latest military action? The observatory said Russian jets hit positions of the jihadist alliance Hayat Tahrir al-Sham (HTS) and the Ahrar al-Sham group on Friday. "The aim was to destroy rebel fortifications," observatory head Rami Abdel Rahman said. HTS is designated by the UN as a terrorist group and has an estimated 10,000 fighters in Idlib. Earlier in the week, Russian jets were reported to have carried out about 30 strikes on rebel-held areas in western Idlib, the mountains of Latakia province, and the Sahl al-Ghab plain. 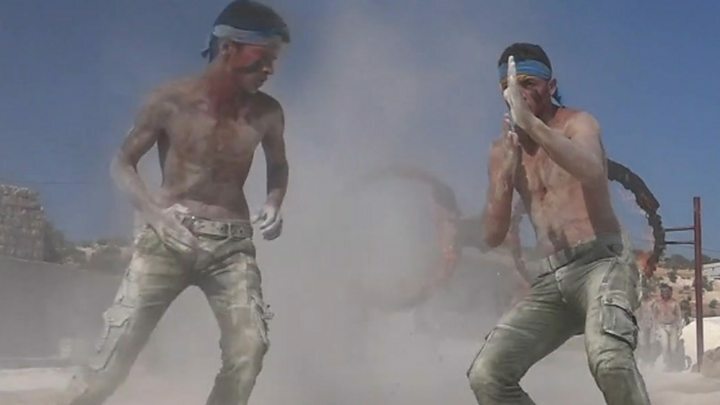 Syrian army soldiers and allied militiamen are reportedly massing for what has been described as a phased offensive. HTS and rival rebel factions backed by neighbouring Turkey have said they will fight back. At a trilateral meeting between Russia, Iran and Turkey on Friday, Russian President Vladimir Putin rejected Turkey's calls for a truce in Idlib. Mr Putin said Russia would continue its fight against "terrorists" in Idlib province. Turkey - which has long backed some rebel groups - fears an all-out assault will trigger another major refugee crisis on its southern border. President Recep Tayyip Erdogan told his Russian and Iranian counterparts: "We don't want Idlib to turn into a bloodbath." "Any attack on Idlib would result in a catastrophe. Any fight against terrorists requires methods based on time and patience." However, Russia and Iran say jihadist groups in Idlib must be wiped out. Meanwhile, Mr Putin said "the legitimate Syrian government has a right and must eventually take control of its entire national territory". Idlib straddles major highways across Syria and if it is retaken by the government, would leave the rebels with just a few isolated pockets of territory across the country. The province is not controlled by a single group, but rather by a number of rival factions, including a jihadist alliance linked to al-Qaeda, and a rival National Liberation Front which is backed by Turkey. Without a political solution in Syria, "we will see this war reach new levels of horrors", the UN special envoy on Syria, Staffan de Mistura, said.